With a growing belly, its become harder and harder to find flattering dresses. With my boys I only showed up front and was 100% all baby, this time around I’m starting to show everywhere! haha Probably has something to do with the fact that this is my third pregnancy and this was bound to happen eventually. I’ve learned to just embrace it, because this body of mine is creating a beautiful life. However- I hate trying on dresses for church, because most of the time they just don’t look good on me. 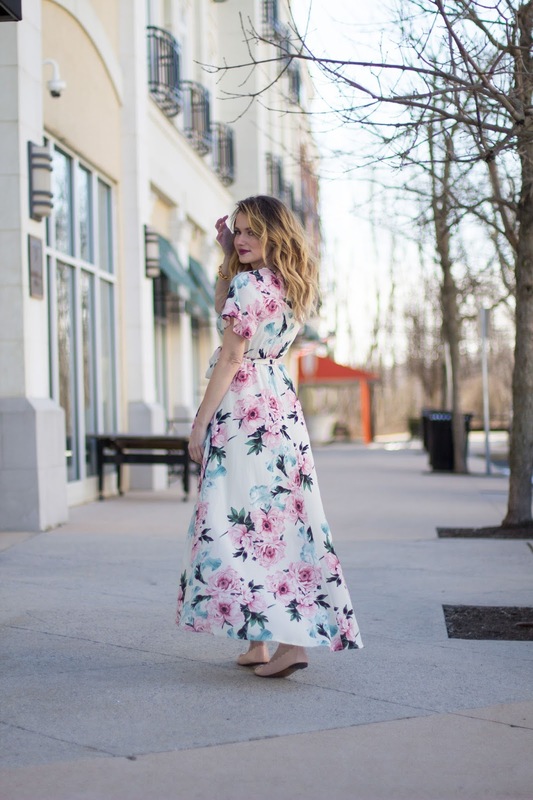 This hi-low floral dress however, is flowy and hugs in just the right place. It shows off my baby bump, while still looking feminine and beautiful. I wore it to church on Sunday and got so many compliments. It had me feeling confident all day long. I love the gorgeous floral print, and the high low bottom; making it easy to show off my scalloped ballet flats. 🙂 This dress is actually not maternity, and would look adorable on anyone pregnant or not. But, if you are looking for a maternity dress; I would definitely consider this beauty. Next Post Shopbop Spring Sale! !